Before moving on to other thoughts I will briefly address Kloster Eldena since we are on the topic of brick gothic abbeys transformed into ruin parks. 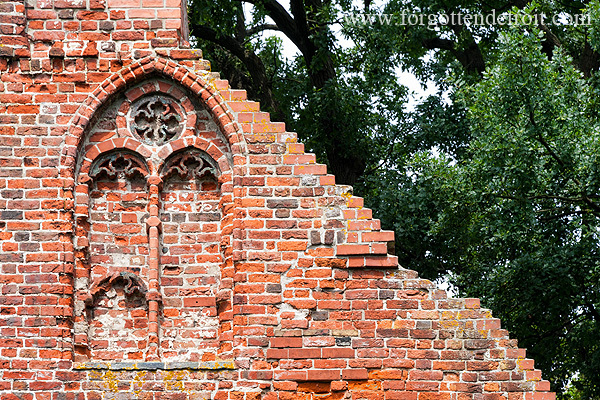 Kloster Eldena is located in the town of Greifswald in Pomerania, not far from Germany’s Baltic coast. 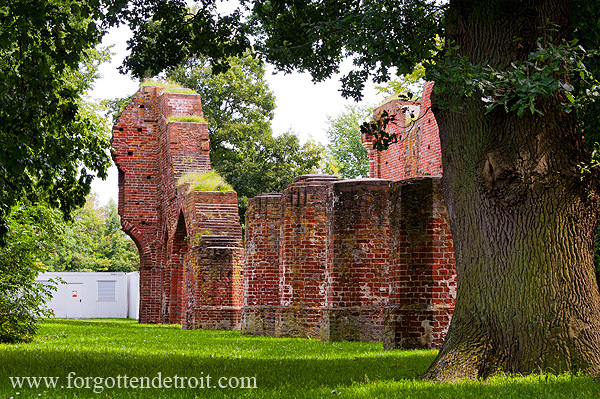 At a glance it is fairly similar to Kloster Hude, an assemblage of wall and arch fragments arranged within a park. But despite the similarities there are a few unique aspects of this ruin that I feel worthy of mention. Kloster Eldena was founded in 1199, originally known as Kloster Hilda. Like Kloster Hude, it prospered until the Reformation lead to its closure in 1535. Afterwards, the massive brick gothic buildings fell into ruin after being damaged in the Thirty Years War and their condition continued to deteriorate into the nineteenth century. However, it is at this point where things become interesting. 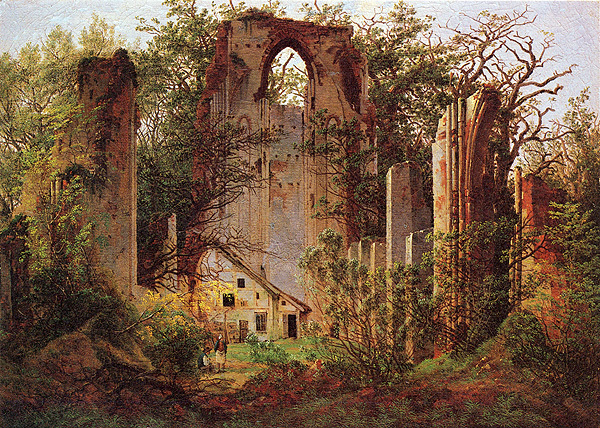 The ruins became a favorite subject for Romantic painter Caspar David Friedrich. His picturesque images of the jungle-like overgrown ruins became popular and lead to increasing public interest in the site. As a result, stabilization work began in 1828 and eventually a park was laid out. What I find interesting in this story is the role played by artwork in the preservation of the site. I suppose you could say that painting was the early 19th century equivalent of today’s ruin photography. Though I am hard-pressed to think of any recent example of a site being preserved due to beautiful pictures. But awareness is something, and for better or for worse, there are abandoned buildings in Detroit known all over the world due to the photographs taken of them. Off to one side of the former nave a handful of rooms remain relatively intact. In the largest such room I found the space arranged for a production of The Jungle Book, complete with stage set. Signs indicated a whole summer series of plays. What a wonderful use of the site, I thought. I’ve been told that, in Europe at least, such a use of ruin sites is quite common. Just a couple of weeks earlier we had visited a hilltop fortress ruin that had been the site of a festival day’s prior to our arrival, and passed a former industrial site hosting an electronic music festival a week before that. Oh, to imagine the concourse of the MCS utilized in such a fashion. Or better yet, one of the canyon spaces within the Packard plant, with the concrete and brick walls rising up on either side. Ruins as performance space, somehow I have a hard time picturing that ever happening in the Great Lakes region. 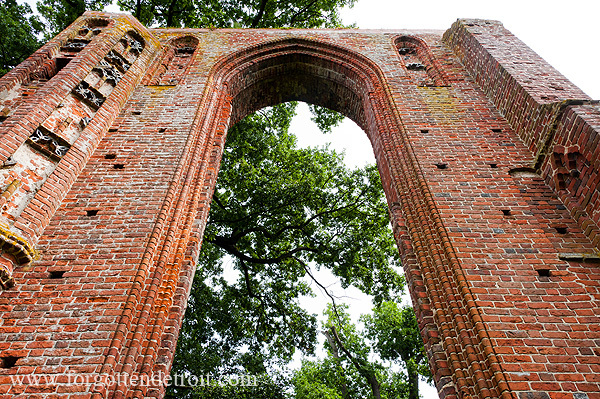 As a park I found Kloster Eldena to be less picturesque and spiritual than Kloster Hude. The landscaping of the park is far less natural, giving the site an appearance of being some wall bits in a mowed field bearing little resemblance to the overgrown wild images of Caspar David Friedrich’s paintings. The row of porta-johns set up for the theater patrons doesn’t help. But the site, being less remote and highlighted on European Brick Gothic Route brochures, also receives more visitors, which isn’t a bad thing. 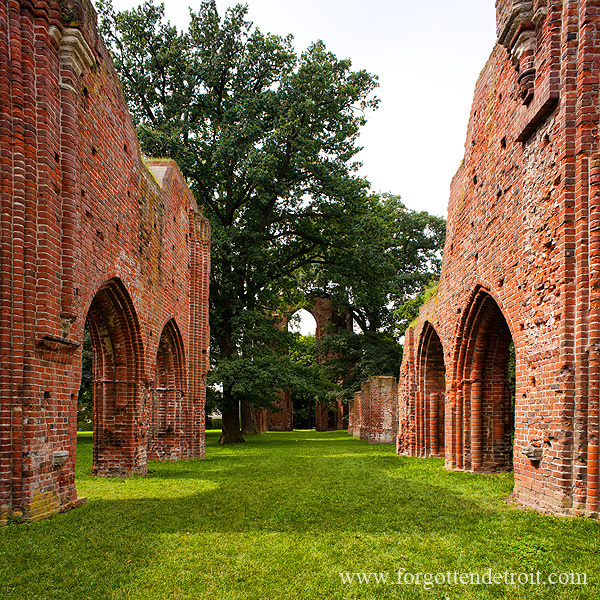 As with Kloster Hude, the preservation of the ruins of Kloster Eldena as a park demonstrate a possible adaptive reuse of a ruin that is well beyond hope for traditional restoration. If conditions are right and the will is there a structure can continue to contribute to a community’s history, society and culture, even if it has outlived its original function, fallen into disrepair, or been partially destroyed. 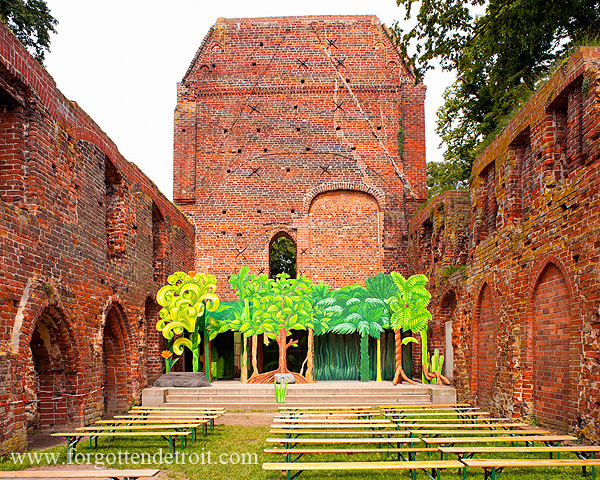 As a ruin Kloster Eldena has provided Greifswald with a park and cultural monument for nearly two hundred years.